This page is part of our special coverage Tunisia Revolution 2011 . After several months of wandering, 30 Tunisian migrants are currently sleeping rough in a park in Paris. #Botzaris36  [fr] is the hashtag launched on Twitter to help them out both financially and legally, in what is a complicated legal and political situation involving France and Tunisia. Support comes mainly from the Botzaris36  [fr] blog and the grass roots organization Action tunisienne  [fr], including several French and Tunisian activists, such as Amira Yahyaoui (@Mira404 ), @menilmuche , Tunisian activist @Ooouups , @Pierrederuelle  and Jérôme Godard (@leclown ). If I can't help with money, I can help with my arms or simply by being there. On May 31, 2011, after a long journey from Tunisia triggered by the fall of Ben Ali, the Tunisians migrants arrived in France via the Italian island of Lampedusa  [fr]. Some had papers from the Italian government which allowed them to stay in Europe for several months. Some Tunisian migrants [have] taken over the “Tunisian Cultural Centre” located at 36, rue Botzaris, in Paris, in order to have a roof over their heads, a place to put a mattress and to rest after an exhausting journey, weeks of wandering and days of battling – in vain – so that the documents given to them by the Italian authorities might be accepted in France. 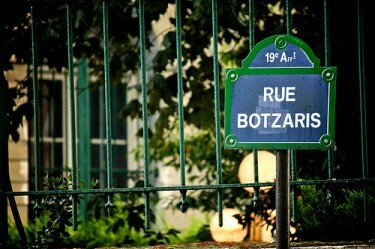 36 rue Botzaris, "Annexe" of the Tunisian Ambassy in Paris. Image by empanada_paris on Flickr (CC license 2.0). Around 50 Tunisians from Lampedusa  [fr] piled into the Tunisian Cultural Centre on Tuesday, May 31, on rue Botzaris, located on the outskirts of the Buttes-Chaumont park in the 19th arrondissement of Paris, asking for “a helping hand” from their ambassador. This building has an extraterritorial status, comparable to that of an embassy. This stronghold represents one of the bases from which the Tunisian regime control[led], repress[ed] and attack[ed] the Tunisian community in France. It was from this place that Ben Ali's orders came, where attacks, intimidation tactics and slander against Tunisian refugees took place. Blog Fhimt has provided a translation into French  of a report by news channel Al Jazeera. This report outlines the discoveries made during their stay by the occupants, in the archives of this very strange building – a former meeting place of the RCD, dictactor Ben Ali's political party. Within 72 hours, a third of the documents from 36 rue Botzaris disappeared, the police evacuated the building and the (Tunisian) ambassador reclaimed possession of the building. @fhollande : #Botzaris36  je ne serai pas présent ce soir, mais je suis votre situation de près. Je viendrai dans les prochains jours. Je m'y engage. Vincent PfRuner has posted a photo essay  [fr] on the journey of the “Tunisians of Lampedusa”.